﻿ Junction Hobbies and Toys - Ohio. Find It Here. Visit this fully stocked hobby and toy shop located within EnterTRAINment Junction! Open daily, Junction Hobbies carries a large selection of Thomas and Friends, Lego, Playmobil, Melissa & Doug, Callico Critters, Smithsonian and more! 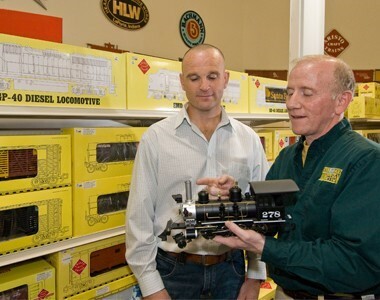 Find "G" gauge Trains and accessories from Bachmann, USA Trains, Aristo-craft and Heartland as well as buildings from Piko and Pola. Real Good toys, dollhouses and a large selection of 1" and ½" furniture and building supplies can also be found. Shop HO and N-scale trains, sets, and layout building supplies, from Bachmann, Atlas, Woodland scenic and Ozark Miniatures.